The Gini coefficient is the most commonly used method of measuring income inequality (World Bank, 2012). The Gini coefficient lies between zero and one where zero indicates complete equality (i.e. everybody has the same income) and one represents complete inequality (i.e. one person has all the income). The higher the Gini coefficient the greater is the inequality. The measures I present in this paper are based on snapshots (cross section) in particular years. If we looked at income inequality from a lifetime perspective, international evidence suggests that it would be significantly less. A lot of inequality is temporary in nature, reflecting either the stage of life an individual is at or the transitory shocks they experience. UK research estimates  a Gini coefficient for gross income in the cross section of 0.49 compares with 0.28 across the whole of adult life. Interdecile ratios are another method available to measure income inequality. Interdecile ratios compare the income between different income groups. One interdecile ratio used is P90/P10 ratio which is the ratio of the income of those in the highest decile to the income of those in the lowest decile. Based on the 90/10 measure it is clear that wage inequality has declined significantly over the last twenty years. Sources: ‘Voitchovsky et al. (2012)’ and ‘Holton and O’Neill (2015)’ present the results sourced from the corresponding study. The key measure of income inequality is disposable income. When taking into account taxes and transfers, Ireland’s income inequality is below the OECD average. This reflects a tax and transfer system that is very effective in redistributing income. The Irish income tax system (including USC and PRSI) is the most progressive in the OECD (OECD Taxing Wages 2016). The Irish system is most effective (both absolutely and proportionately) at reducing inequality, significantly ahead of the next most progressive countries Belgium, Finland and Greece). Market income inequality in Ireland is the highest in the OECD (OECD Economic Survey Ireland 2016). Market income is income before taxes and social transfers. Why is market income inequality so high? Ireland’s high inequality of market incomes largely reflects its uneven distribution of labour earnings. This is associated with the returns to tertiary education and the penalty for poor education both being higher in Ireland than the OECD average. A high share of the workforce with tertiary education earn more than twice the median income. A possible contributor to the high earnings premium for tertiary education is the strong presence of multinationals, which offer highly paid jobs to those with high skills. By contrast, those with below upper secondary education are concentrated at the bottom of the income distribution. These skill-based wage differentials have important effects on the overall distribution of earnings because Ireland has a higher percentage of 25-64 year olds with a tertiary degree (40% versus 33%) and about the same share of those with below upper secondary education as the OECD average of 24%. Other contributory factors include the very high level of “jobless” (Very Low Work Intensity) households and a relatively large agricultural sector with low incomes. Those considered to be at risk of poverty have an income adjusted for household size below 60% of the median income. In 2014, Ireland’s at-risk-of-poverty rate rose to 16.3% compared to 15.2% in 2013, however it was below the EU average of 17.2%. Deprivation is measured by the Central Statistics Office by asking survey respondents if they have experienced any of the following eleven types of enforced deprivation. If respondents identify themselves as having experienced two or more of the items, they are regarded as deprived. Deprivation rates have increased significantly reflecting the impact of the economic crisis. They have now reached very high levels in one-parent households, those living in rental accommodation (at below market rent or rent free), and the unemployed. In 2014, 29% of the population experienced two or more types of enforced deprivation. Table 1 below shows the deprivation rate experienced by three different age cohorts: namely 0-17 years, 18 to 64 years, and 65+ years. Deprivation rates are shown over the period 2008 to 2014. The youngest age group (0-17 years) has the highest deprivation rate, at 36.1% in 2014. Deprivation among this group has increased significantly between 2008 and 2014, with an increase of 18 percentage points – almost one-fifth of the age group. Likewise, deprivation amongst the core working-age group of 18-64 year olds has more than doubled over the period, peaking at 30.5% in 2013. The 65+ age group has also experienced an increase in deprivation. However, those over 65 have the lowest deprivation rate of the three age groups. The 0-17 age group had more than twice as many people (36.1%) having experienced enforced deprivation than those in the 65+ age group (14.3%) in 2014. Those living in households where there was one adult and one or more children (lone parents) had the highest deprivation rate in 2014 at 58.7%. The second highest deprivation rate was among those in accommodation that was rented at below the market rent or rent free (54.5%). The third highest deprivation was found among individuals who described themselves as unemployed (53.4%). The lowest deprivation rate in terms of the principal economic status of the head of household was found in the retired group (12.5%). 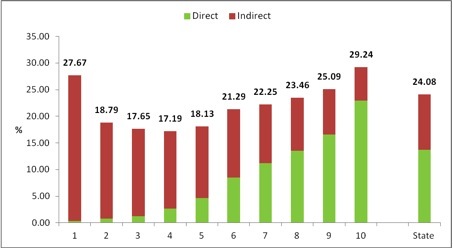 Figure 1 below shows the changes in the deprivation levels experienced between the ten different income deciles. Deprivation has increased across all deciles, with the largest increases in the bottom half of the income distribution. Deprivation rates have increased across the Irish population. 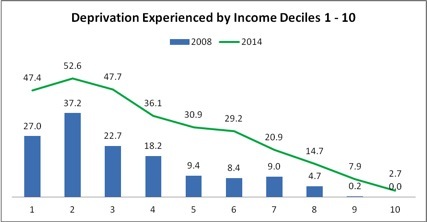 Deprivation has increased most among those in the lower and middle income deciles since 2008. The younger age group (0-17 years) has a significantly higher likelihood (36.1%) of experiencing deprivation in contrast to those aged over 65 years (14.3%). Lone parents had the highest deprivation rate (58.7%) in 2014. An important contributory factor to poverty and deprivation is lack of work. Over one in five Irish households are “Very Low Intensity Working Households” (VLWI) (21.1 %). This is by far the highest in the EU and is almost twice the EU average (11.2%). Even in 2008 the number was very high at 14.3% (1 in 7). Such households have a much higher risk of being at risk of poverty. The more work a household does, the less is the household’s risk of poverty. Ireland has the highest levels of very low work intensity households in the EU. Households with least work are 27 times more likely to be at risk of poverty than those with most work. Is the Tax System Progressive? 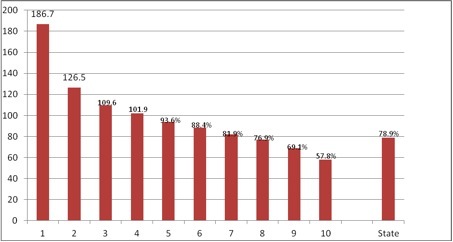 Collins has estimated taxation as a percentage of gross income based on the Household Budget Survey 2009/10. The analysis finds a regressive indirect taxation structure with the average household paying just over 10% of its gross income in indirect taxes. People in the top decile pay over 20 per cent of their gross income in direct tax. As a result their disposable income is 80 % of their gross income. Since VAT paid is related to expenditure, a proportional VAT will by definition be regressive as a percentage of income. This impact is mitigated in Ireland (uniquely in the EU with the exception of Malta and the UK) where food which accounts for a sizeable part of the expenditure of low income people is zero rated for VAT. For example, Finland charges 14 % and Denmark charges 25 % on food – so our VAT system is more progressive than other countries. The claim that VAT is a highly regressive tax rests on the fact that for the people in the lowest 10 per cent of the income distribution (the bottom income decile), VAT expressed as a percentage of income is extremely high. The main reason for this is that in the bottom decile in Ireland, expenditure is almost double recorded income (186%). See Chart below. Research  shows that households with the lowest recorded incomes on average tend to have higher living standards than is indicated by their household income (where living standards are measured by expenditure, consumption and/or material deprivation). Excises are among the most regressive taxes particularly in the case of tobacco. In Ireland those in the bottom decile spend absolutely more on tobacco than those in the top decile. Reducing tax on tobacco would be the single most effective tax change to increase the progressivity of the system. However, incidence of smoking and smoking related diseases is higher among poorer people. Successive governments have decided (rightly in my view) that the health argument that higher excise duties discourage smoking is more important. Almost 40 % of households in this category did not have medical cards. The annual equivalised weekly income of this group was below €181.04 in 2014. The Basic Supplementary Welfare Allowance  plus Child Benefit in 2014 was in excess of these amounts. •	They are entitled to benefits but are not claiming them. •	They are not entitled to benefits because while their income is low they fail the means test due to their holdings of assets. •	They are self-employed and have very low incomes or are making losses during the survey period. •	They are in full-time education. How Can Ireland Reduce Inequality? By international standards, Ireland provides generous social family support. Social transfers are funded by a progressive tax system. Other policies to reduce inequality should be directed at investment in education particularly among the disadvantaged and taking steps to tackle the very high level of jobless households in Ireland. Choices about the precise degree of redistribution in society involve trade-offs between the need to preserve an appropriate incentives to work, save and invest and to ensure that everyone enjoys an adequate standard of living. This paper makes no attempt to suggest where that balance should be struck but merely to set out what is the current position in Ireland and how we compare with other advanced countries. Choices in this area inevitably involve value judgements and are questions that ultimately must be resolved by politicians. The EU indicator of ‘very low work intensity’ is where less than 20 per cent of available adult (up to age 59) time is allocated to paid work. Most very low work intensity households have no working age adult in employment. The Survey on Income and Living Conditions (SILC) is an annual survey conducted by the Central Statistics Office (CSO) to obtain information on the income and living conditions of different types of households. A representative random sample of households throughout the country is approached to provide the required information. The survey is voluntary from a respondent’s perspective; nobody can be compelled to co-operate. Supplementary Welfare Allowance provides a basic weekly allowance to eligible people who have little or no income. This is a means tested payment and the provision of Basic SWA payment (BSWA)is very similar to the provision of primary payments such as Jobseekers Assistance. People with low incomes may also qualify for a weekly supplement payment under the Supplementary Welfare Allowance Scheme to meet certain special needs, for example, help with rent/mortgage interest payments or for urgent or exceptional needs. In 2013 supplementary welfare payments. Holton, N. and D. O’Neill (2015). ‘The Changing Nature of Irish Wage Inequality from Boom to Bust’. Maynooth University Department of Economics, Finance and Accounting Working Paper Series, N264/15. Voitchovsky, S., B. Maître, B. Nolan (2012). ‘Wage Inequality in Ireland’s “Celtic Tiger” Boom’. The Economic and Social Review, Vol. 43(1), pp. 99-133.